We Love Feedback We always listen to our guests & we continually strive to do things even better! Don't take our word for it...here is some feedback from recent guests. Another amazing time away in your fantastic park. Both adult and kids facilities are wonderful. The Sheppard family can’t wait to visit again! Susan Read – 20 November 2018 Just wanted to say a quick thank you for a great stay last weekend. Special mention to Kristal who helped me out with the booking and the young guy who did an awesome job processing my eftpos while the other team member was busy with a complex booking.We booked for our work Christmas party and all the staff and kids had a wonderful time. Staff mentioned that they would be back. Facilities are fantastic and your staff are wonderful. Sorry we were a bit noisy on the Friday night. Look forward to coming again. Grank_Bernlio – 10 Oct 2018 As a retired couple my first reaction was to stay clear of the “Great Aussie Holiday Park” as we were looking for R&R and their activities list was long so I was thinking more for the younger generation – so glad we decided to give it a go! We stayed in our caravan at an unpowered site and no sooner had we set up and I back to reception to extend our stay! There was a large group of young families enjoying the water park and jumping pillow but as the park is so large their laughter and fun could only faintly be heard in the distance from our site. Near our location was about 4 acres of mown grass with trees and shrubs with lots of birds around. A great place to walk our dogs. We also took advantage of the lake foreshore and activities area (another 6 + acres of mown area) to wander around and just relax. Definitely on our favourites list of places we have stayed and we plan to return. Corinne – 7 April 2018 This is such a great family park. We stayed with the extended family, some of us camped in tents, and others had cabins. There were so many other families with kids, we virtually didn’t see our kids, as they were always off at the playground, jumping pillow and water park. There was a lovely pool area also, and my youngest enjoyed riding his bike around on the BMX track. Everyone was excited about animal feeding. There was a main staff member who was always around to make sure everyone was behaving and that amenities were fine, and I did see him ask people in their cars to slow down, which was good with so many kids around. There was a lovely big bbq area which we made use of, and the amenities block was large and always clean. Would be nice if there was another amenities block though. Although I guess it wasn’t too far, in the middle of the night it was a bit of a distance. David D – 13 November 2017 Spent a week here in November, a weekend with a family birthday party and the next 5 days by ourselves. The park is large and accommodating, Whether you’re pitching a tent, hiring a cabin or driving a big 5th wheeler, there’s plenty of room for everyone. It has a great entertainment /BBQ area including a function room, games room and kids club. The staff are excellent and will go out of there way to ensure your every needs are met. And of course there is the lake, which is the catchment for the surrounding areas drinking water and it is huge, only at about 80% capacity during our stay. So if it’s fishing, swimming, skiing, or just boating about this is a place you must visit. If water sports aren’t your thing there are also wineries, micro breweries and historical places to visit in the surrounding area. We will be back every year for a visit. Robyn Marchioni – 27 April 2016 We held a 70th birthday party at this amazing holiday park over the Anzac Day long weekend. 60 adults and 19 children. The park caters for all needs. Caravan sites, ensuite sites, tent sites & cabins. The play areas for kids include: Swimming pool & spa. Water park. Tennis court. Large play area. Flying Fox ( supervised during holiday periods ) Rock Climbing ( supervised during holiday periods ) Kids Club Movies in the theatre The Great Aussie Holiday Park has the largest & best camp kitchen in Australia. It includes a huge outdoor area with tables & chairs. 6 large BBQ’s, washing up area with hot water, a huge indoor area with seating surrounding a large indoor open fire, a kitchen with everything you could possibly need including a coffee machine. A conference room and a theatre. The 2 rooms can be opened to one huge area for large parties and a stage is included. Catering can be arranged through the park. The catered meal provided for our party was fantastic. The park is safely way away from anywhere so the kids could play freely and safely and the parents could relax. Thank you to The Great Aussie Holiday Park and their staff for providing the most amazing venue to hold a great party. Christine Pike – We have just come home from spending 3 wonderful nights at your park and it was great. The staff were wonderful, very helpful and nothing was an issue. We all had a wonderful time there, so much to do and cabins are great. Everything you need for a wonderful relaxing holiday. We will definitely be back again hopefully next time for longer. Thank you for making our holiday one to remember. 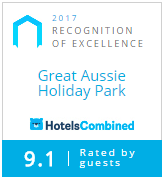 Steven – 29 January 2018 Just spent Australia Day weekend at the park what a great park would recommend to families this place has everything backed up with friendly professional staff do yourself a favour and visit you will not be disappointed we are going back just rebooked. Shayne – 6 September 2017 Have stayed at this park serveral times staff are great , amenities very clean, is very much a summer park with Lake Hume at the door step but also a great place in winter with the large under cover BBQ area which has two massive log fires which the staff kindly provided wood for us for the two nights we where there , a group of 8 of us where there in August & had a great time around the fire of a night , you can also take your own camp fire if you wish with some restrictions but the community one is great for meeting other campers, great place for the kids & the fishermen & water sports, large pool, games room , play ground all round entertainer, will certainly be back. Jacinta Anderson – 23 January 2016 Just returned from an awesome 8 days – the facilities & accommodation options are fantastic – the children’s activities available are great – we had an ensuite camping site which was fantastic – a great holiday option for anyone & even dog friendly (camping only) – thankyou again to all the staff – we will definately be back. Jacqui Miller – 2 January 2016 What an organised and well run Resort. We have two small children who had endless fun during our 5 night stay, as the park provides many different activities for them many free of charge! The staff were helpful and friendly and we are looking forward to returning. Michelle Clark – 14 December 2016 Thank you so much to everyone at the Great Aussie Holiday Park. My husband, our family, our friends, and I all agree that it was the perfect venue for our wedding on the weekend! You were all so helpful!…. absolute ripper of a destination! Thanks again! George & Janny De Vries – Dear Russell, Mel and Geoff, We just wanted to say thank you for the service you provided for us while we were staying at your holiday park. In particular we want to thank Geoff for helping us hook on the caravan when George had injured his back and also with the problems we were experiencing with the brakes. It did turn out as you suspected, for when we were on the bitumen the brakes adjusted themselves and after a few tries we did not have any more problems. We thoroughly enjoyed our stay at your park. We appreciated the spacious sites, the facilities such as the barbecues, kitchen sinks, the woodfire every evening, the cleanliness of the amenities and much more. The location is absolutely beautiful with the sunsets over the lake and the surrounding hills. And you staff has been so friendly. Thank you once again for your part in a great holiday experience. Silvia Nahon – We had a fantastic time ,can’t wait till next year,really lovely staff, very clean facilities,huge improvement with the new owners, I think they will be the best ever! !cant wait to see what’s new next year. Matt Hard – Hello, I just want to thank you guys for great time, love your resort and look forward to heading back at the next opportunity.